A fantastic pair of vintage scientific magnifying glasses by Phillip Harris Ltd of Birmingham. 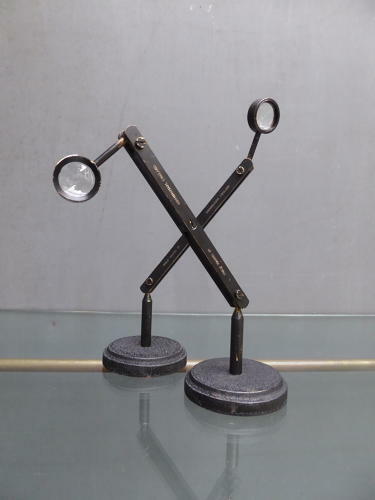 A wonderful pair of articulated laboratory magnifying glasses in solid brass, the upper parts finished in a black laquer & the bases in a black 'crinkle' paint. The diminutive yet powerful lenses are supported by a single arm with double ball-joints which allowed precision positioning in a laboratory environment. Beautifully engineered & so decorative! Wear commensurate with age, very good condition overall with a pleasing amount of wear. Height measurement taken at full stretch, lenses just under 3cm across.